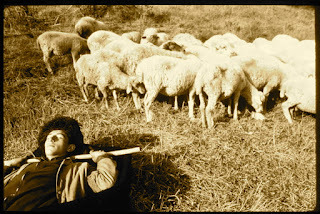 A Year of Being Here: Alberto Caeiro: "The Herdsman"
I'm herdsman of a flock. To think a flower is to see and smell it. To eat a fruit is to sense its savor. And know the whole truth and am happy. "The Herdsman" by Alberto Caeiro (Fernando Pessoa), from Poetry (October, 1955). Translated by Edouard Roditi. Photography credit: "Young Shepherd Sleeping," by Armineh Johannes, 1992 (originally color).